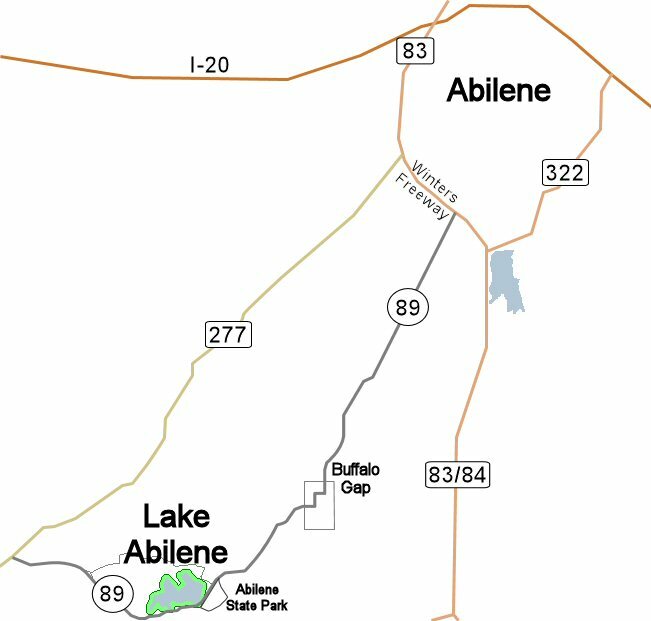 Lake Abilene is located on Hwy. 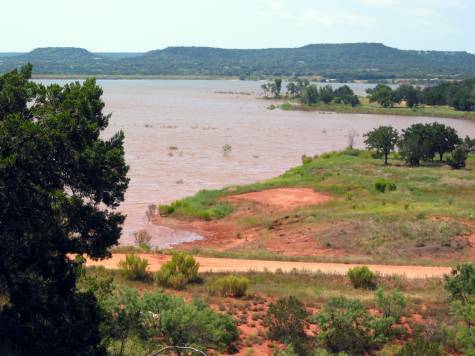 89, approximately 1 mile south of the entrance to Abilene State Park. 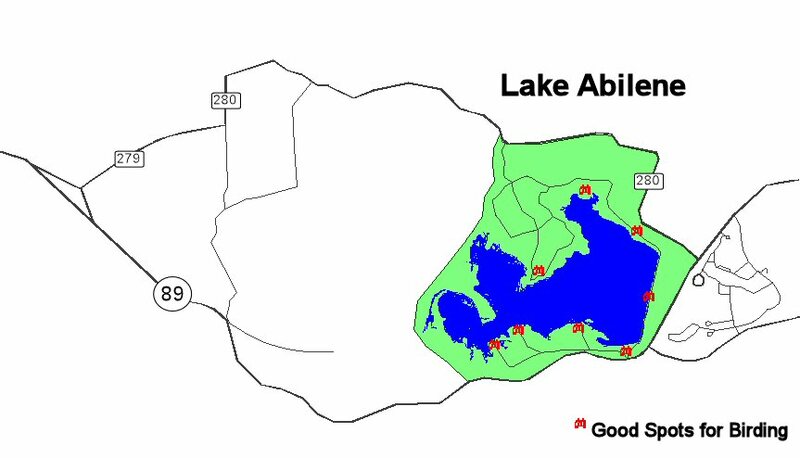 The lake is now part of the State Park and you must check-in at the Park to obtain the code to the gate and access to the lake. Fee is $4.00 each for ages 13 and above. The lake is open from sunrise to sunset. 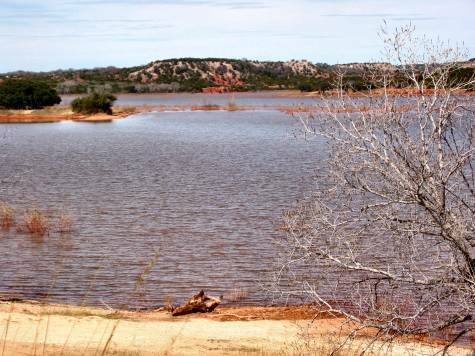 The lake is good to bird in the winter for ducks and shorebirds and in the spring Blue Grosbeaks, Painted Bunting, Indigo Bunting, Bullock’s Oriole, Rufous-crowned Sparrow, Lesser Goldfinch, Eastern Kingbird and other passerines can be found. Mountain Bluebirds and Western Bluebirds are found in winter but not every year. Vehicles are not allowed on the dam, but you may certainly walk this area. If you walk the dam, pay attention to the area to your right. Seepage from the lake occurs here and there’s always something interesting to see. A Red-shouldered Hawk is frequently seen in the large trees below the dam and in the red clay hills past the dam Rufous-crowned Sparrows can be seen. If you turn to the left upon entrance, the scrubby mesquite trees along the fence line is a good place to bird. There are several roads that lead down to the lake, each worthy of investigation. Below is a photo of the lake in winter. After birding the lake, if time allows, do a birding loop around the lake by traveling south on Hwy. 89, take a right on CR 279, take a left on CR 280, and then 280 loops back around to Hwy. 89. There’s the opportunity to see sparrows in the fields and hawks soaring overhead. Several low water crossings intersect the road and these are worth checking. The first photo was taken in July while standing on a hill on the north side of the lake looking towards the southeast. The second photo was taken in February on the dam looking towards the hills where the first photo was taken.